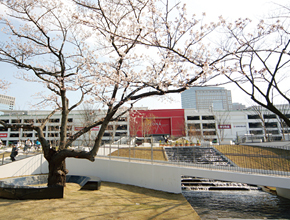 The Lazona Kawasaki Plaza is a large commercial establishment which is popular among people of all ages. Known as the "land of anything you could ask for"; fashion, dinning and entertainment are all available in our 300 specialty shops. 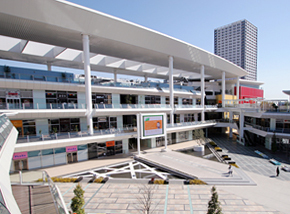 This large roof is the symbol of the Lazona Kawasaki Plaza community. It was designed by the Spanish architect Ricardo Bofill. Various events such as music concerts are held on this stage during every weekend. This store is full of "cute things" like anime products, sundries and stationary goods. Both children and adults can enjoy shopping here. This store offers everything in one place from cameras, TV, audio, home electronics and computers, to games, suits, alcohol and so on. A cosmetics store with a huge selectionof top domestic brands. Our professional staffs will help you to choose the perfect item based on your needs. Changing with the times, we offer an original style with warmth, artistry and natural taste for men, women and children. Sushi made with the freshest seasonal seafood out there in the market. Suhi in our seating area is 390 yen or 290 yen per plate with two pieces, while the sushi is only 260 yen per plate with two pieces in our standing area. Now you can eat to your fullest extent with this easy-to-follow pricing.. Without conforming to one specific style, our chef will create a natural food sensation for you to enjoy along with our special selection of alcoholic beverages. Delicious sweets are made with the finest ingredients. Beginning with our "Ikkonzome" which is designated as a famous confection of Kanagawa prefecture, we have a variety of local sweets for you to choose from. There are 4 roads on the north side of the parking structure where you can enjoy greenery that changes during each season. You can see the benches below our 8-foot tall cherry trees.